rodeasdown.com.au – How to blend beautiful sound with beautiful looks. In the context of self-driving cars, cryptocurrencies and Alexa, loudspeakers are pretty damn boring. The base technology has been around for more than a century and whenever a manufacturer comes up with a new ripple enhancing the process it’s usually so esoteric that explaining it takes more words than I get here plus a couple of diagrams, and even the most focused of readers will have glazed over by paragraph three. 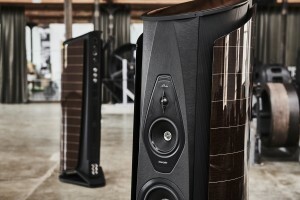 Better then to take the approach of Franco Serblin, who started the Italian speaker company Sonus faber in 1983. He decided, after bitter experience (I’m getting to that) that at Sonus faber aesthetics would be just as important as sound quality. This was rad in 1983 because other brands were coming up with designs that put sound quality ahead of everything. Especially looks. There were speakers with horns sticking out, there were speakers shaped like windswept nautilus shells, some looked like garden gnomes, some were garden gnomes. Lots seemed to be modelled on the unadorned female figure. All of these sounded fine but you wouldn’t actually buy them. And hardly anyone did. It took a while for the penny to drop but these days speaker makers generally concede that Franco nailed it; if a speaker is to be placed on display in a home it needs to be something that at best is gorgeous and at worst won’t get the neighbours snickering. Well, if you want people to buy it anyway. Sonus faber’s export sales manager, Jean-Philippe Fontaine, was in town recently and while I wanted to talk about aesthetics he, a sound engineer, wanted to talk tech. We found some middle ground discussing how tech and aesthetics can go hand in hand when designers are clever and work hard. Example; Sonus faber’s signature cabinet design is based on a lute, with sidewalls that curve gently out and then back in from front to rear. This is not just elegant, it ensures that soundwaves inside the cabinet don’t bounce directly back to hit the rear of the cone, interfering with its work. Another: Cabinets must be rigid meaning serious speakers have solid internal bracing, taking up room in there, but several Sonus faber models have bracing as an exoskeleton, with narrow lines of smoothly finished aluminium dividing up the timber and leather. One last deliciously clever example: Bass reflex by stealth, where the port is actually a disguised vent extending up the back panel. Sure there’s ingenious engineering too. Jean-Philippe can wax lyrical about silk dome tweeters with damped apexes, tuned mass dampers to avoid ‘spurious inner vibrations’ and suspension between cabinet and floor to prevent sub-bass notes rocking the floor and, in turn, the speaker itself, but while tech always needs explaining beauty never does. “We have always regarded aesthetics as being of equal importance as sound. It is our culture,” he finally allows. Timber is a constant in the designs and the company has two cabinet factories and a third making drivers and crossovers. They’re all close by Vincenza, between Milan and Venice. Ah, beautiful things from northern Italy. Prices start at $699 but don’t stop until $160,000. So, Franco’s bitter experience. 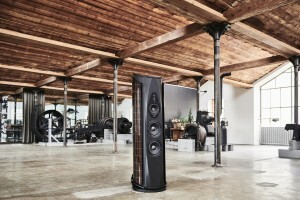 He made his first speaker three years before he started Sonus faber and it was ugly as a bagful of claw hammers. A boxed subwoofer supported two tweeters rising up on stalks like the antennae of a snail. Total production? Ten. Sonus faber unveiled a modern interpretation of it in 2016, the minor difference being that the tweeters were retractable when not in use. The major difference: it was beautiful.